Palestinian chief negotiator Saeb Erekat said he will "shoulder his responsibilities" if it is found that confidential documents encompassing a decade of negotiations between the Israeli government and the Palestinian Authority were stolen from his office. 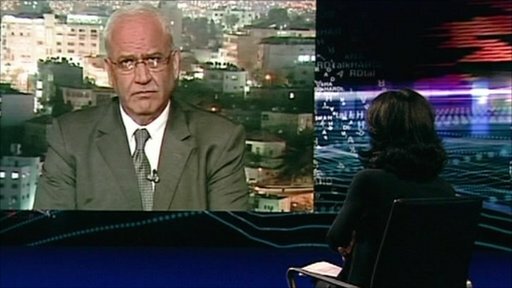 Speaking to HARDtalk's Zeinab Badawi about the peace process, Mr Erekat said that current Israeli policies were "destroying" the two-state solution. The full interview was broadcast on Tuesday 8th February 2011 on BBC World News and on BBC News Channel.